Collins Booksellers - College Student Development by Wendy K. Killam, PhD, NCC, CRC, LPC & Suzanne Degges-White, PhD, LMHC-IN, LPC-NC, NCC, 9780826118165. Buy this book online. 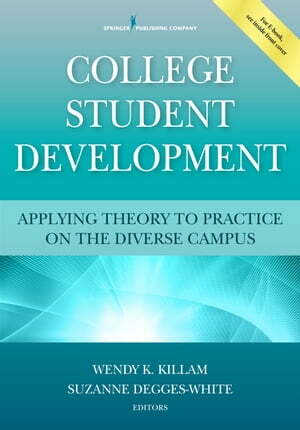 This is a timely and comprehensive overview of key theories of student development that illustrates their application across a range of student services with diverse student populations. It is distinguished by its focus on nontraditional student populations including adults changing careers, parents, veterans, and international students. The book examines relevant theories of cognitive, ethical, moral, and personality development and theories of identity development in terms of ethnicity, gender, and ability. Also covered are theories relevant to disability issues, LGBT identity issues, and to choice of career and major/degree. Unique to the text is information on how theories can be applied, beyond understanding individual students, to student groups and to guide the coordination of student affairs services across the campus. Engaging case vignettes immerse readers in diverse perspectives and demonstrate the application of theory to a wide range of student types and issues. The book covers the history and development of each theory along with its strengths and limitations. Also included are useful suggestions on how to best assist students with current challenges. Reflective questions concluding each chapter help students to reinforce information. An insightful text for courses in college student development in relevant graduate programs and for student affairs professionals who wish to enhance their abilities, this book reflects the realities of contemporary college student life and student affairs practices.